Edibles are everywhere. This “new” garden trend has its roots in the Victory gardens of WWI and WWII. When times get tough or supplies of food are low, we think about going back to the time when “everyone” grew their own food. This time around, there is also the desire to take back some of the control over what we eat. If you grow it, you know what’s in it. And there is no denying that a home-grown tomato beats a grocery store tomato in flavor and eye appeal. If you decide to embrace the task of growing some of your own food, you must understand two fundamental principles of creating and maintaining edible gardens and landscapes: edible landscapes are not low maintenance, at least, not initially; and edible landscapes are environmentally friendly. Maintenance: plan before you plant! Decrease your maintenance load over time by including perennial herbs, fruit and vegetables that require less maintenance once they are established – such as asparagus. 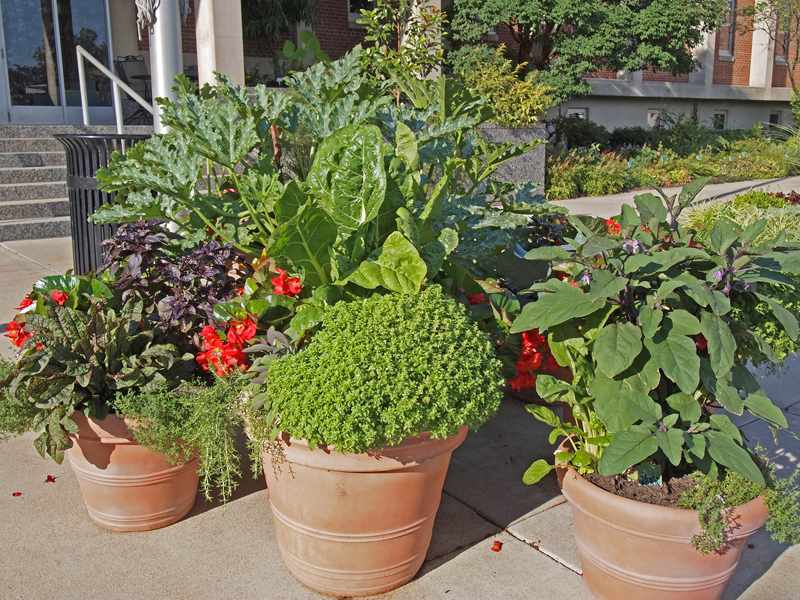 Take the time to understand the balance of an edible garden. Nature is a web of checks and balances that we alter in our garden-making process. Work with nature by using fertilizers and pest management practices labeled for food crops such as biological controls and cultural practices. The products you use on the lawn and landscape may not work here. Essentially, if you treat the environment well you will be treating yourself well, too. When you create any garden or landscape there are four factors to consider. PART 1 covers the first three factors. Part Two will contain Plant Selection. Site Selection: you’ve heard it before – figure out what you have! Look at where you have sun and shade, wet areas and dry areas, and compacted soil. Where are your microclimates: warm spots where you can push the zone; cold spots which will harm emerging plants? And, then think about the surrounding environment. Will you need to protect your garden from visiting animals? Are there any restrictions imposed by your community? In some subdivisions, vegetables in the front yard are not considered to be in good taste. Nirvana for many vegetables, fruits and herbs would be full sun, well-drained, fertile, friable, loamy soils with a pH around 6.5 where there is little root competition from trees and shrubs. It would rain twice a week in the morning from 6:00 to 7:30, soaking the ground. No weeds would grow, no animals or insects would eat the leaves or fruit and, you would be able to spend less than an hour a day to harvest your bounty and keep everything running smoothly. Not your situation? This leads to the question: how much of the bed prep, planting and maintenance will you do yourself and how much will you pay for? Budgets are often ignored because we go out, buy some seeds, a few plants, some compost and then we have to find the time to do it. Two of your biggest costs will be the materials and time to create the foundation for a successful garden: soil that is amended with compost that will support the growth of the plants. If all you have is 20 minutes a week to garden, maybe a container or two is a more realistic goal and then support your local farmer at the many farmers markets that have sprung up in the Midwest. There are a variety of methods for preparing the soil that range from removing the sod and rototilling to the no-till technique of sheet mulching. If you are adding edibles into existing beds you will be “spot-prepping” in between plants. No matter which method you use, the end goals are to eliminate or prevent weeds from growing and to increase the fertility and friability of the soil. In short: a garden that will grow food. McGee, R.N. and M. Stuckey. 2002. The Bountiful Container. Workman Publishing, NY.Toensmeier, E. 2007. 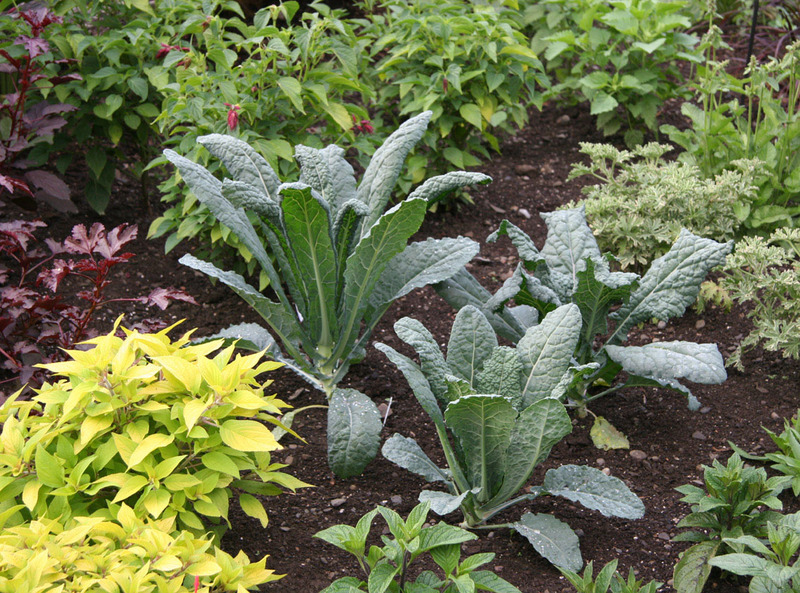 Perennial Vegetables: From Artichoke to ‘Zuiki’ Taro, a Gardener’s Guide to over 100 Delicious Easy-to-grow Edibles. 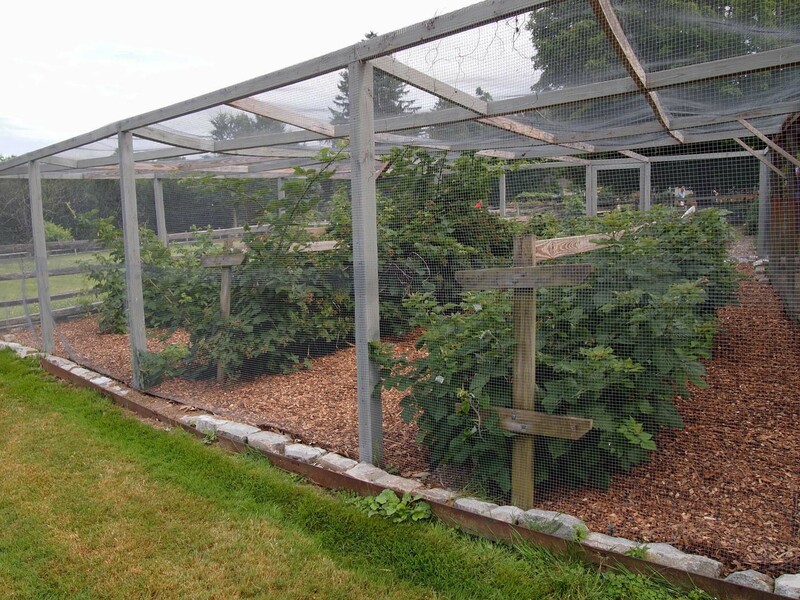 Chelsea Green Publishing Co., White River Junction, VT.
Is sheet mulching effective? What do you usually use? I tried rocks but weeds still grow on those little spaces in between the rocks. I have found sheet mulching to be very effective. I layer newspaper, cardboard, compost, leaves; it depends on what I have. Basically you want to smother perennial weeds and prevent annual weeds from germinating. Yes, you may have some perennial weeds poke through, but they are often weakened by the energy they had to expend to grow through all the layers. They are usually easy to remove if you get them out of the garden when you first see them. You will always have annual weeds as they blow in with the wind. As for using rocks: they are only in my rock gardens. You have given me a blog idea: write about my very young forest garden that was started using sheet mulching. And, lastly: check out the book Lasagna Gardening. It will give you more specific information.